This week we're pleased to present the picks of Ian Hamilton (The Imam of Tawi-Wawi), Sam Wiebe (Cut You Down), Dave Butler (Full Curl), Mark Lisac (Where the Bodies Lie), and Dietrich Kalteis (Ride the Lightning). I'm a huge fan of the travel/memoir genre. To my mind, writers like Bruce Chatwin, Eric Newby, Pico Iyer, and Norman Lewis who can weave history, personal stories, geography, politics, culture, and social mores into wonderfully complex stories are to be treasured. All of those writers have British roots, and so does another of their ilk: Paul William Roberts. But since Roberts has lived almost his entire adult life in Canada, and identifies himself as Canadian, I have no trouble claiming him as one, and I have no trouble choosing his book The Demonic Comedy as one of the best Canadian books I've ever read. Roberts—who has a doctorate in ancient Middle Eastern history—writes about Iraq pre-, during, and post-Gulf War. His book spans the years 1990 to 1995. His descriptions of the people, their history, their plight, their leadership (Saddam, goddamn), are horrifyingly funny, poignant, dramatic, and revealing. And they are descriptions that could only be written by someone on the ground who understood what he was seeing and hearing. His first trip in 1990 was to cover the Arab summit, but his main focus is Iraq. Among other things, he describes how Hussein's Stasi-trained secret police keep the general population in a terrified state. But the highlight (or lowlight) of that visit was his interview with Saddam himself. The morning of the interview, Roberts is hungover and takes a tab of Ecstasy. If that sounds Hunter Thompsonish, it does fit with some of Roberts gonzo journalism prose. But even fuelled by a drug that is supposed to make one mellow, Roberts is chilled by Hussein. His second trip was in 1991 when he was one of the few foreign journalists to witness the devastation the Gulf War brought upon Iraqi civilians. This trip was followed by another in 1995—eight years before Hussein was finally deposed—and details an almost clownishly incompetent, but brutal leadership living in a dream world, and a population trying to deal with the horrors wrought on them by Hussein, the aftermath of U.S. bombing, and oh—by the way—one thousand percent inflation. 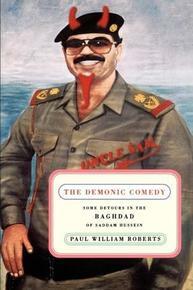 Roberts' Iraq makes the reader laugh, decry, and wince in almost equal measure. But for anyone who wants to understand a country that has been demonized, but not often understood, his book is a terrific place to start. Ian Hamilton is the author of the Ava Lee series. With the publication of the Imam of Tawi-Tawi, the series is now eleven books and counting. The books have been published in seven languages, and in more than 20 countries. They have made multiple bestseller lists, and have been shortlisted for many awards including the Barry, the Lambda, and Arthur Ellis. Curry is a book about food and culture and the assumptions we bring to art, The best feature of Curry is its tone. Cultural criticism often suffers from being high-handed and humourless, or irreverent and squawky. Ruthnum delivers an appealing blend of sarcasm, cogent analysis, and personal history. 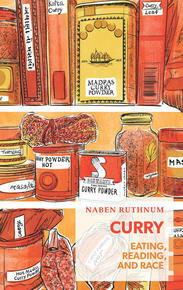 Using examples from Jhumpa Lahiri to Gordon Ramsay, Ruthnum makes a clever and nuanced argument about "currybooks," mainstream novels that play up a certain mythologized version of Indian-ness, and how that impacts his writing career. It's thought-provoking and funny—how many books can claim both? I admit it. 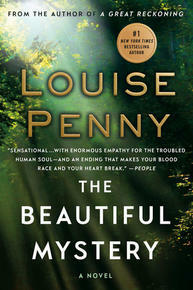 I’ve read—no, savoured is a better word—every Louise Penny novel, all fourteen of them. And I look forward to the release of Kingdom of the Blind this fall. However, The Beautiful Mystery is the one book in the Chief Inspector Armand Gamache series that haunts me. And I mean that in a good way. I first heard the story as a book-on-tape, and I have reread it twice since then. Number eight in Louise’s series, it’s a magical and hypnotizing blend of mystery and music, isolation and murder, all set within the stone walls of a single remote Quebec monastery—Saint-Gilbert-Entre-les-Loups. The mystery in this novel is largely the identity of a murderer in the monks' midst, but it’s also the way in which the monks' Gregorian chants impact those who sing them and those who hear them. Another mystery is where I might find some of those dark-chocolate-covered blueberries made by the monks ... but I digress. While I admit that my introduction to chanting monks came from "Monty Python and the Holy Grail" (you too? ), Gamache and his second-in command don’t find hooded men hitting themselves with wooden boards when they pass through Saint-Gilbert-Entre-les-Loups’ massive front door to solve the murder. Instead, they find harmony threatened by dissonance. In the end, the magic in the chants comes from the notes themselves, and from the silence between the notes. For me, the haunting magic in The Beautiful Mystery comes from Penny’s well-crafted descriptions and dialogue, and the dark silences in between. Dave Butler, from Cranbrook, BC, is author of the Jenny Willson mysteries (Dundurn Press). The first in the series—Full Curl—won the 2018 Arthur Ellis award for Best First Crime Novel in Canada and was a mystery category finalist in the Rakuten Kobo Emerging Writers Awards. The second in the series—No Place for Wolverines—will be published this fall. 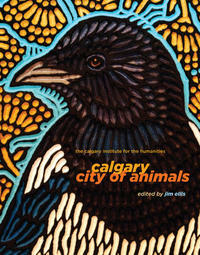 Often irritating, packed with tantalizing bits of information, shifting between close observation and esoteric theorizing, bright with splendid graphics (although underlying images at times interfere with the text)—there are plenty of reasons to both like and dislike the essays in Calgary: City of Animals. Don’t feel like being hectored into switching to a diet of insects and a meat substitute chillingly called ”Soylent”? Suspicious that “social justice” for cats and skunks can go too far? You can concentrate instead on representation of animals in art. Or perhaps on the way that the romantic presentation of “wild” bucking horses in the early years of the Calgary Stampede belied an industrial exploitation that included the killing of newborn foals. Edited by Jim Ellis, this co-production from the University of Calgary Press and the Calgary Institute for the Humanities had two virtues for me. It made me think. And it entertainingly presented ideas that subvert standard notions of Calgary culture. The same team has just published a similar book, this time about water in Western Canada, titled Water Rites. Mark Lisac worked in journalism for 40 years in Saskatchewan and Alberta. He wrote two non-fiction books on Alberta politics, edited or contributed to other books, and most recently wrote Where the Bodies Lie, which was shortlisted for the 2017 Crime Writers of Canada best first novel award. 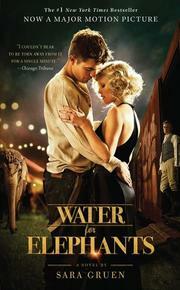 If you’re looking for a great summer read, you won’t go wrong with Water for Elephants by Sara Gruen. What I liked most was Sara’s terrific voice in bringing the setting and characters along with the magic of the circus to life. The story’s focus is on the seedy side of circus life during the Great Depression. And the characters are colourful and interesting and do what’s necessary to survive, working at a place where you could get fired by getting tossed from the back end of a moving train. The story looks through the eyes of Jacob Jankowski, now an aged man, who reflects back on his younger days when he ran away with the circus. Hiring on as the show’s vet, the younger Jacob ends up falling for the wife of the show’s director, an unbalanced, unpredictable and often violent man. There’s a good pace and constant suspense in a well-researched story that comes to life through Sara Gruen’s wonderful descriptions, a book that took me back to those times of the traveling circus. Dietrich Kalteis is the award-winning author of Ride the Lightning and House of Blazes (both medal winners at the Independent Publisher Book Awards), as well as The Deadbeat Club, Triggerfish and Zero Avenue. He lives with his family on Canada’s West Coast.